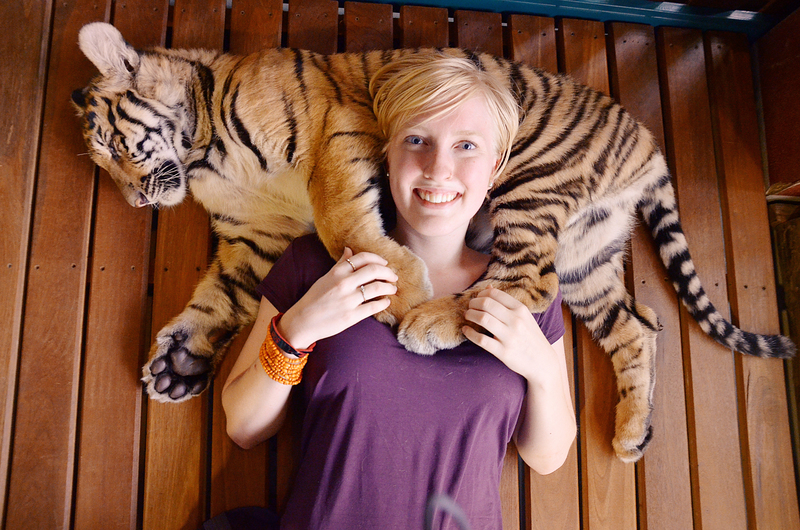 Tiger Kingdom in Chiang Mai, Thailand is the stuff of cat lovers dreams. 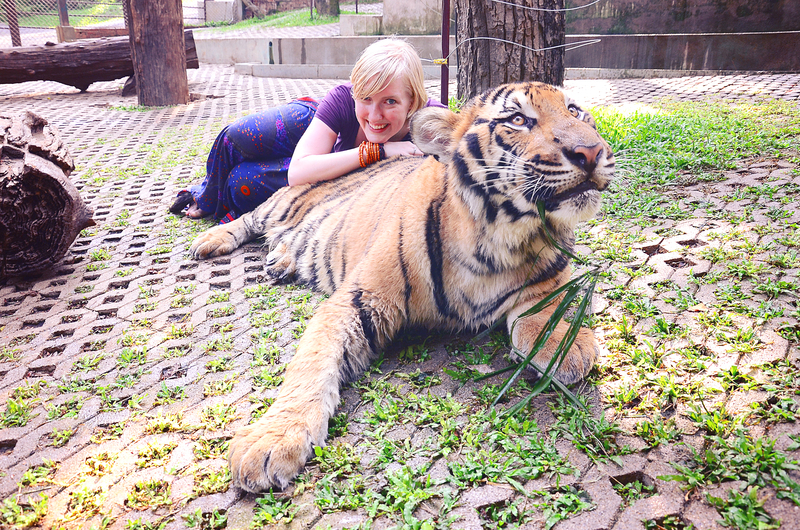 Ever since I can remember, I fantasized about snuggling up to a tiger or lion and making it love me. I would never have thought that could be a reality and still keep my head. Well, in the exotic land of Thailand there are more than a few options to make this dream into an actuality. Now to begin with a disclaimer, I know some of these facilities are shrouded in controversy and many people may be disgusted that I even chose to visit such a place. In my defense however, I did a lot of research before deciding to go and from the many reviews I read it seemed that it was a “go see for yourself” kind of situation. 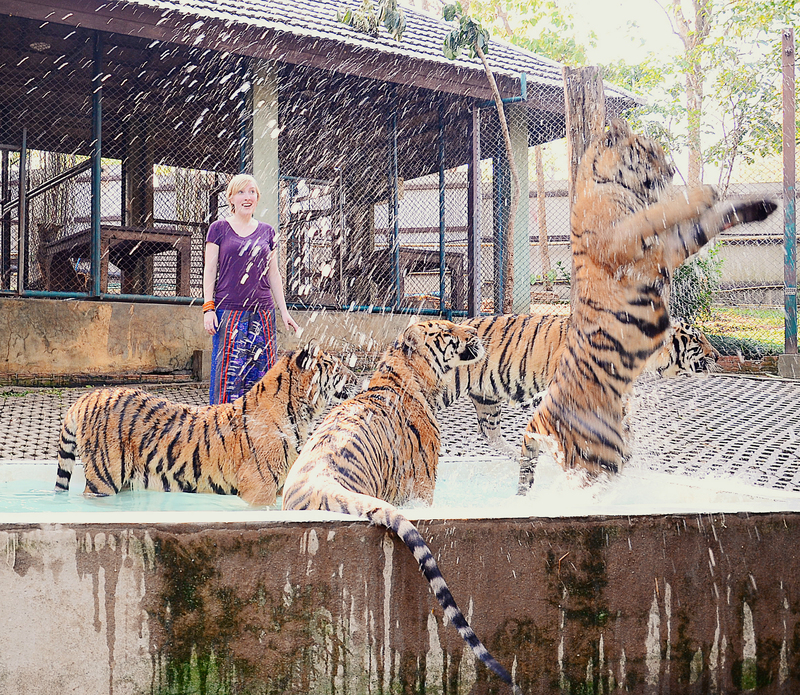 From my experience at Tiger Kingdom in Chaing Mai I saw no mistreatment and there was absolutely no way that these cats were drugged. Quite the contrary, they were actually the most active big cats I’ve ever seen. There are many other enclosures that tourists don’t enter that had even more felines inside, meaning that the same cats aren’t being fondled everyday. These cats seemed to have the same quality of life that any other animal would have in a zoo, which granted isn’t as wonderful as in the wild, but at least they weren’t being made into rugs and coats like many of the animals in this part of the world. I can not speak for any other facility of this kind but would go as far as recommending this to my readers. 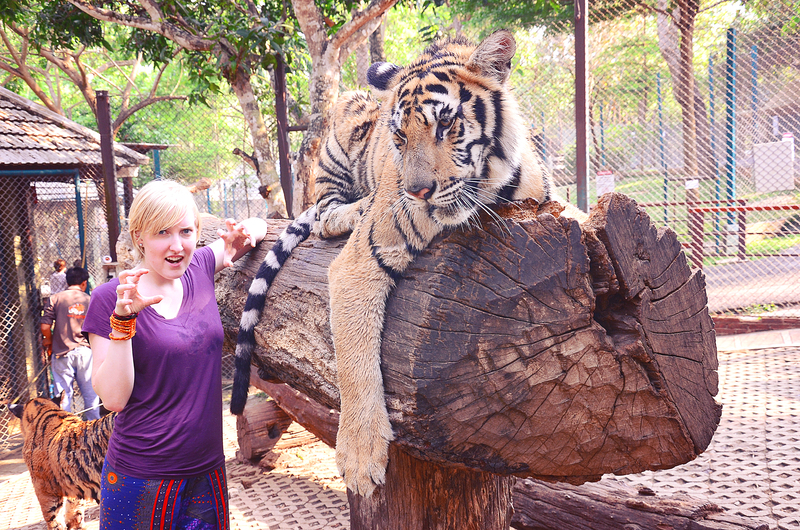 I took a tuk tuk from my hostel in the Old City to Tiger Kingdom on the outskirts of Chaing Mai. It was about a 40 minute tuk tuk journey and cost around 250 baht which included the driver waiting for 2.5 hours while I visited the animals. I loved the ride there, tuk tuks are the bomb. Upon arrival you choose which sized tigers you would like to go in the enclosures with (big, medium, small, and smallest). They are a variety of prices and offer different packages. You spend about 10-15 minutes in each cage which seems short but in reality I did not feel rushed at all. FREE photographer service for 1 cage. There is also a photographer service for 299 Baht per cage from which you receive about 50-70 pictures from each cage. All the pictures will come on CD for you. Being a solo traveller I decided to go with the photographer option which I think was well worth the money. All of the photos featured on this post were taken by the photographer and he even used my camera to film everything on the video above! I went with the Take 3 package which came with a buy two get one free photographer so I got photos in all three cages! After you’ve paid they bring you in by groups of 10. Once inside the grounds it’s up to you to decide what size cat you want to see first. The babies are the most popular so you can go give your number to the handlers there and by the time you’re done with the big cats you can basically walk right in with the cubs. At least that’s how it worked out for me. I started with the biggest cats. Go big or go home, right? They only let about 5 people in at a time and each group has its own guide. Since I was solo that meant I had my own guide and photographer so I was well looked after. Let me just start by saying I never once felt unsafe. The cats seemed very content to just lounge and do their own thing. They are cats, so sleeping 18 hours a day is a priority. Once inside you get to visit each of the cats. There were five in the big cats cage and we went to each one. You, naturally, are placed away from the head area to avoid any temptation to become a mid-afternoon snack for the kitty, but are able to pet, rest your head on, and even rub their belly if they allow. The guide and photographer that I had seemed to want to impress me with their courage and seemed awfully chummy with the tigers. I think if they were to eat someone it would probably be the guy tugging his ear and not the gentle, little, blonde chick. Next, I moved into the smaller cat enclosure, but these guys were still pretty large. They were also active. Really active. There were probably about 10 in this cage and they were wrestling each other in the pool. It was a pretty surreal experience to be so close to these animals who could literally maul me to death if they really had a hankering for some American jerky. The same photographer followed me through all three cages and started getting me to do some more silly poses like the one below. Just go with it. As a former Disneyland photographer, I knew all about the stupid poses and just to say yes. This cage was more about observing these majestic creatures due to their hyperactive behavior whilst in with them. I ended up sticking with this cutie for the remainder of my time in the cub area. She got up and became very, very active. She was afraid of my pants which was a bummer but let me love on her when I sat, legs away. The guide played with her a bit and showed me how to get her comfortable. When my three experiences were up I waited 20 minutes for all my photos and then headed back to my hostel truly in awe of my experience. This is something that I will get to tell my grandkids about someday or at least be able to one up people at parties with this story. 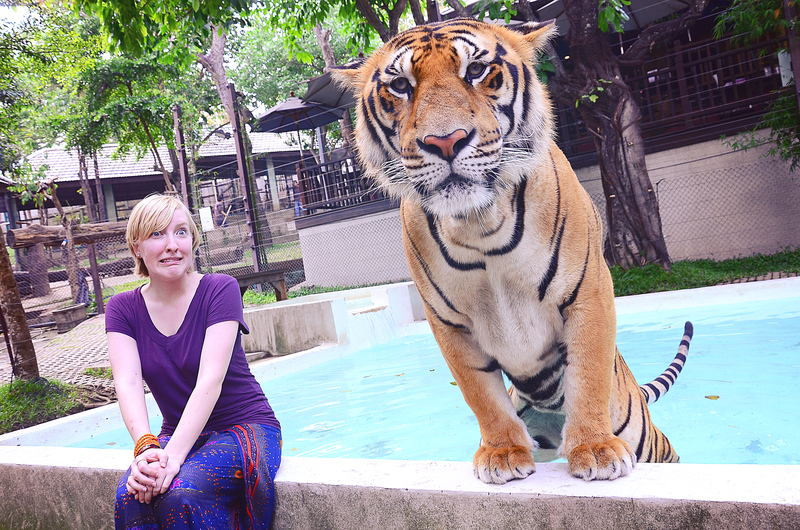 As a through and through animal lover I say this is a must do if visiting Chiang Mai. 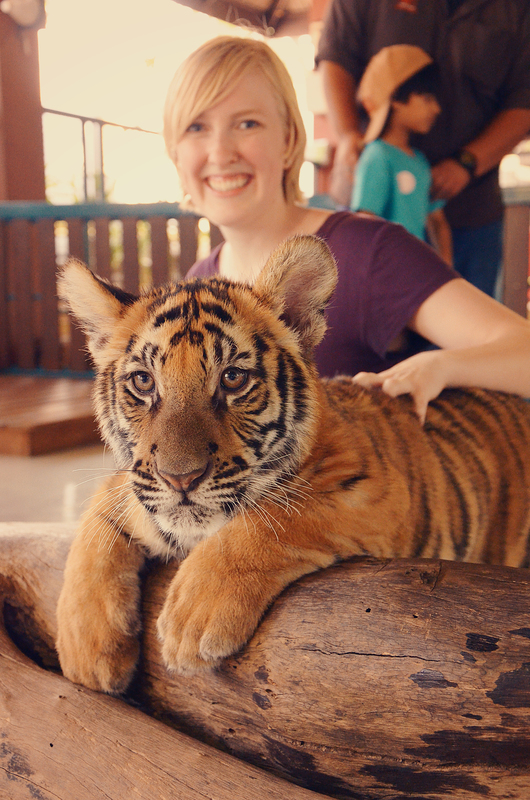 When else would you get to take a nap with a tiger cub?! 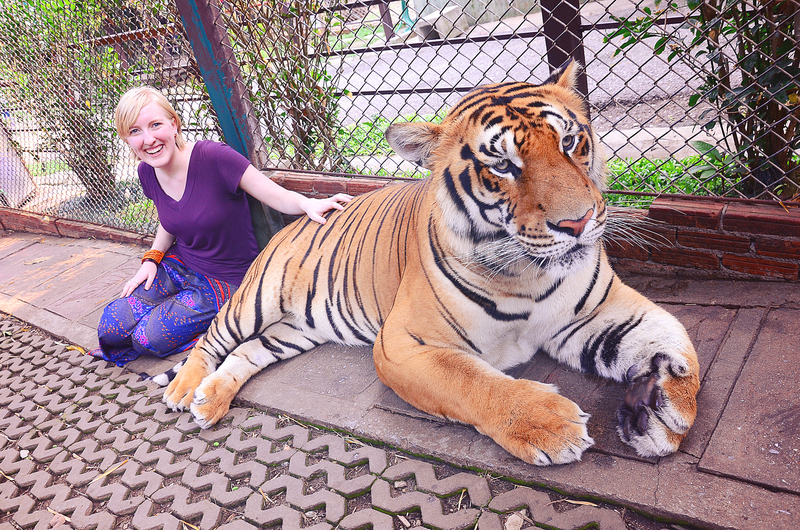 Do you dream of snuggling a big cat? What other type of animal would you like to experience in this capacity?